Pirates… we need more of them. And where do we get more pirates? From little pirates, of course. This is why it’s so important that that wee ones are inundated with pirates during their upbringing. Sure, they should be made to read Treasure Island, and forced to watch the Pirates of the Caribbean flicks again and again and again – but it’s also vital that the necessary pirate exposure occurs in unexpected and surprising ways. Such as in a children’s video about the importance of moving water in our world – yeah, stuff like that. 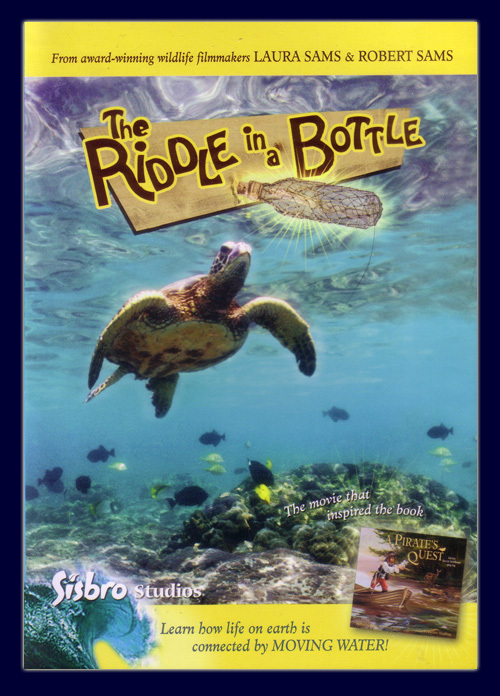 The Riddle in a Bottle is not what one would generally seek out if looking to provide their kiddies with their daily pirate quotient. In fact, your child might simply believe they’re about to learn about the tides, currents, sea turtles, ponds, and all that sort of stuff. And they will – and in a fun, child-friendly way that incorporates humor, song, and talking sea critters. But then at the end, providing they’ve been good and been paying attention, they’ll be rewarded with a singing pirate! And truly, can there be any greater reward for learning? I tell you, if singing pirates were at the end of every scholarly pursuit, I’d still be in school to this day. The Riddle in a Bottle is brought to us by brother and sister team Laura and Robert Sams, who’ve apparently done all sorts of respectable work with regards to educating the young’ns about the natural world. But finally they’ve incorporated pirates into their work, which means they’ve reached the pinnacle of their craft. The film is short – only 30 minutes – but seems longer (in a good way) as it’s chock full of learnin’. Older adolescents might find the material way too kiddish to enjoy, but younger kids should enjoy every minute. This entry was posted in Books and tagged children, educational by Bilgemunky. Bookmark the permalink. What kind of world do we live in where Tobacco, Rum and Prostitution isn’t enough to sway children into a piratey lifestyle.